Point Montara Lighthouse is a working beacon AND a Hostelling International hostel. How cool is that? Very…to me at least! Why? Because I grew up on a small island in between Manhattan and Queens in New York City. At the northern tip, there was a lighthouse. I’ve been obsessed ever since. Situated alongside the Pacific Coast Highway (Highway 1), the Point Montara Lighthouse is just 25 miles south of San Francisco and easily accessible by car on a day trip. I had visited the lighthouse before on a birthday adventure with my wife; but not at sunset. These photos came from my most recent visit with Randy, a childhood friend with whom I spent many-a-day playing wiffleball by the lighthouse on our island. Originally established in 1875 as a fog signal station after several ships ran ashore in the late 1860s, this historic lighthouse is still an operating aid-to-navigation maintained by the U.S. Coast Guard. 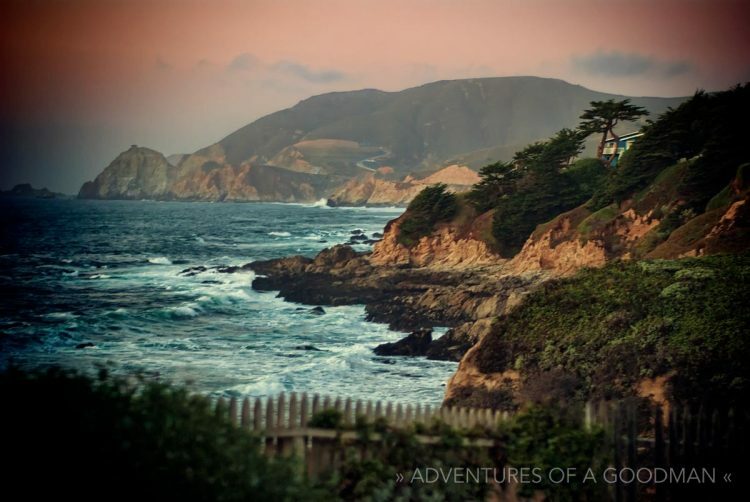 The hostel has been in operation since 1980 through a partnership with California State Parks. Guests are accommodated in both shared and private rooms in former Coast Guard quarters and the historic fog signal building. Enjoy cozy lounges, a secluded beach cove with tide pools, and landscaped native plant gardens. Amenities include DSL Internet and free WiFi, on-site laundry, free parking, and an espresso bar. In addition, you can rest assured that your travel footprint will be minimized, as the hostel is a certified green business.